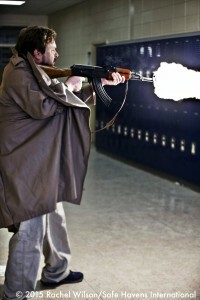 In a scene from one of several active shooter scenarios, Chris Dorn fires an AK-47 fitted with a blank adapter into a classroom. Our school safety video scenario tapings are typically all-hazards in nature. This session emphasized active shooter, hostage situations and incidents relating to school terrorism. The new school safety video scenarios are among the most powerful we have ever produced. Using new video equipment, our video crew was able to use a variety of new special effects to produce even more compelling school safety training videos. (Photo ©2014 by Safe Havens International Staff Photographer Rachel Wilson). We had a long but excellent day of filming scenes for a new school emergency preparedness video last Saturday. Our award-winning video crew did a superb job as did our actors. We were able to tape several versions each of more than a dozen school emergency preparedness scenes. The rough footage looks great and the slow motion footage looks amazing. The experience that our crew has gained filming across the nation as well as in Mexico, Bolivia, Holland, Vietnam, South Africa, and other countries really shows in their work. Safe Havens Video won nearly 40 national awards last year and has won a number of awards in previous year. Our school safety training videos have also been widely featured on 20/20, Larry King Live, Good Morning America, CNN, Fox, Al Jezera America, Tokyo Broadcasting, and dozens of other major media organization. Our school emergency preparedness videos have long been used as model examples by the United States Department of Education and a number of state agencies. We are excited that so many school and public safety officials from many countries now use Safe Havens International school safety training videos. We have additional tapings planned in Georgia and Oregon for this video series. We will be filming additional school terrorism scenarios during and content for a new companion training videos for these scenarios. Our video crew has worked tirelessly to produce so many school safety training videos and they continually improve the quality as well as the scope of their work. It was truly a joy to work with this outstanding crew and cast on what promises to be our most powerful school safety training videos yet.